After my trip, hours of research, and speaking to other travellers & watching their instagram stories in places I did not have time to see, this would be the ultimate no fail route! Bring an UNLOCKED phone so you can buy a local sim card (SO CHEAP). Useful for maps, plan B for Filipino terrible wifi, and ability to use the GRAB app (Uber of philippines) to save you taxi fares. If using Taxis, use the WHITE one. Download MAPSME – free offline map – VERY useful! Bring sunscreen! – 1 mini bottle in El Nido of non-whitening sunscreen was $17 (660P)! Dentistal work and prescription eyeglasses – both are SUPER cheap to do and get in the Philippines! I did a cleaning for $30 and got glasses for $50 in a mall in Cebu. Trip cancelation insurance if you have the budget – some things get canceled / delayed (for me 1 flight + 1 ferry in 3 weeks). 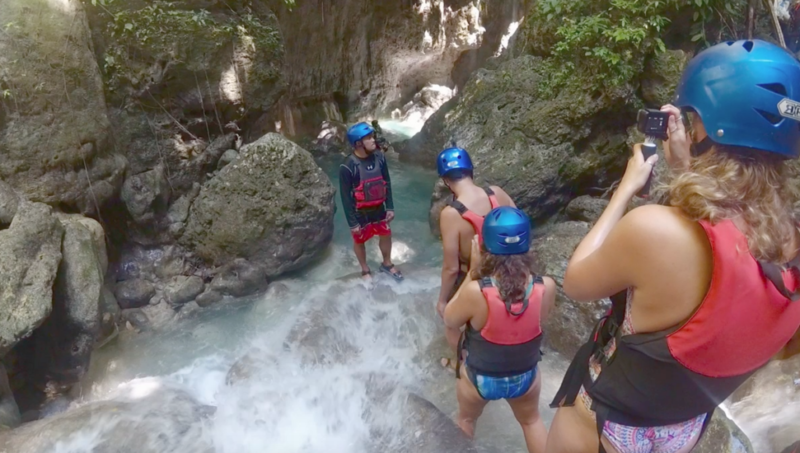 Gopro – you will want to film underwater if you plan to snorkel or dive! They do sell plastic phone pouches for $3-4… But not superb quality and still risky. 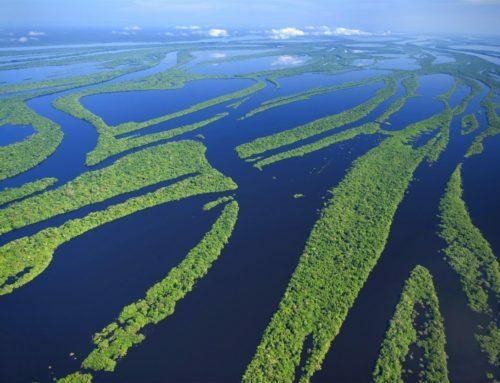 Lonely Planet – good for finding hidden gems and trip planning. All plugs are 250V = 10V too high for Canada (my phone would spark). It still worked, but for example my cheap dollar store portable battery broke because of it. Bring a re-fillable water bottle. You can refill it everywhere (hostels and restaurants). In some cities they have machines costing 2 cents per 250ml refill. Save plastic! Finally as they say travel with ½ as much and bring double $… but actually you can’t always find everything in this country… So bring your essentials & electronics. It is not saturated YET with tourists. Expect to not meet as many people as you think you would. It was more expensive then I thought being so undiscovered, as you can easily fall into the tourist prices because you will want better quality things sometimes. After eating $2 rice meals for breakfast, lunch and supper, you may just want a *$10 wood oven pizza, or $20 seafood platter with wine. Safety: I felt always extremely safe. People are incredibly friendly and even ask you to be facebook friends! I also met solo travellers who went off the beaten path and they felt fine. 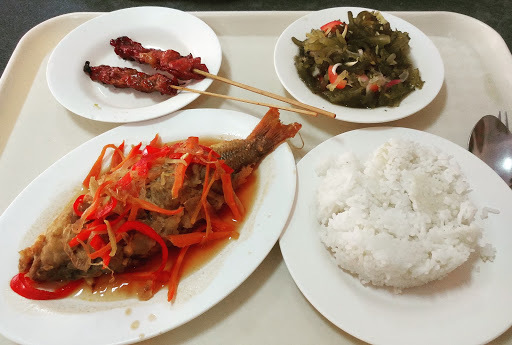 Filipino Food: salty or sweet! The local street food was not mind blowing. It was mostly stews made in the morning that sat in display cases all day, served cold with warm rice. Main seasonings I saw were soya sauce with lots of calamansi limes = salty! Or sweet glazes. Their breakfast sausages are even sweet. 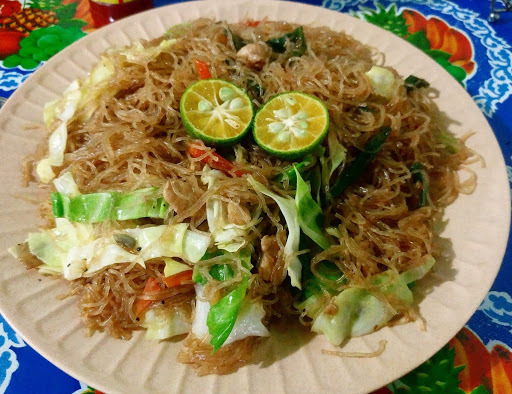 Good dishes to try: Pancit (vermicelli noodle dish), chicken adobo, sisig, BBQ meats/seafood, local stews, and Boodle fight! (tons of seafood on banana leaves), taho (tapioca tofu drink). Accomodation: I stay in Hostels because they offer the best “to do” information, easy to book tours with, and best for meeting people. They also offer private rooms and vary from very basic – to luxury. 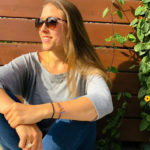 I use booking or Hostelworld apps – try to book in advance in high season. 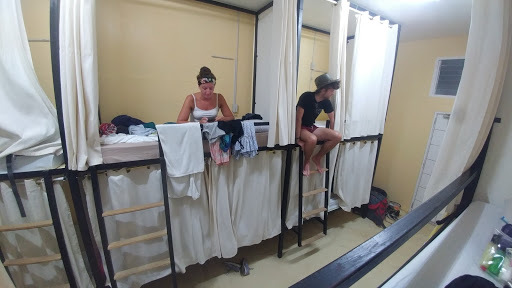 In the Philippines, I stayed in my very first KING SIZE BED bunk! 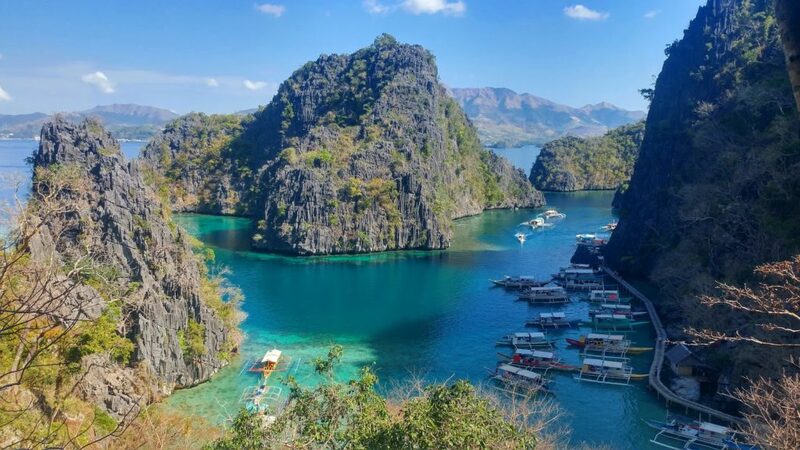 (Hop Hostel in Coron) – so worth the $30/night! I ditched partying to sleep instead! Getting around: #1 way: scooter to explore islands (avg cost/day: $9/day). If you do not, definitely plan a slightly higher budget for taxis or motor taxis. Or find people in your hostel to share with! In big cities the cheapest way to get around are with Jeepneys, but probably a bit challenging for tourists to figure out its direction & cost if you only speak english. I would stay in Manila only if you like to explore new cities. I met a local at the Z HOSTEL rooftop bar and we went exploring on Jeepney rides. We saw the famous Quiapo market & Chinatown. Are they must see? To me no, but I have seen many Asian cities before. NOTE* TRAFFIC IS AWFUL – estimate always 2hrs ONE way for at usual 15min drive. Purpose to come to Manila? Cheapest arrival city into the Philippines, but you can fly after to Cebu for cheap at $40 (or around $50 with 1 luggage on Air Asia). Accomodation: Z Hostel Manila (in Makati). Makati is similar to the tourist area in Bangkok but less special for me… They had midget boxing?? Cebu has a very different vibe then Manila, and a slightly better one for me (more modern). Accomodation: Mad Monkey Hostel – amazing rooftop bar with a swimming pool! How to get there: I went to Moalboal straight from Cebu airport. You can take the airport bus to the big shopping mall (3 stops – 40 mins) – then a white taxi to the south bus terminal (total $5). To Moalboal the bus is 3.5hrs (nice scenery!) – Ceres bus lines – the big AC ones have wifi. Moalboal town: as soon as I arrived I got amazing vibes and knew I would stay longer. It’s relaxed, green, good mixture of locals and tourists, and cute restaurants on a road towards a small & clean beige sanded beach. The town is small enough to feel like you will meet people and not get lost in a million tourists. Accomodation: Moho Hostel. Really nice staff, very big common room, good way to meet people by reserving the canyoneering trip. 5-10 minute walk to the beach, free water refill, comfy beds (with curtains, light and plug). Oslob day trips available too. Snorkel with Sardines – just 5-10 meters out on moalboal main beach you will see thousands of sardines and some sea turtles! Incredible! Free! GoPro worthy! Chili bar – all the backpackers go to this bar at night (good fun!). Try to also explore the other hidden bars along the beachfront via the little market shops. Local restaurants near the bus station – I saw all tons of cheap local eats, fruit stands & street food on my way out and sad I did not go explore it. How to get there: 3 hour bus from MoalBoal and you must transfer buses at the southern tip of Cebu island. If you leave Moalboal too late, you will miss the last transfer bus and have to pay for a private tuk tuk at their desired price. I would leave Moalboal by latest 5pm. Oslob town: Oslob feels more like a pit stop of the side of the road then a town with still a cute mini tourist vibe. There are 3 highlights to do here and by lunch time you can likely do it all. 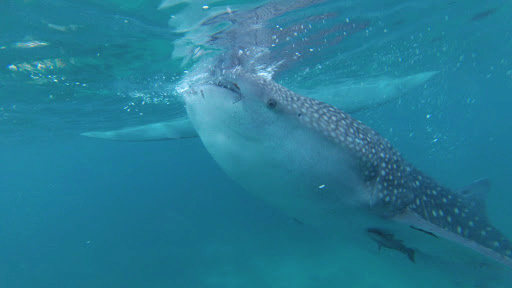 Whale Sharks – if it is not against your morals to snorkel with the whale sharks, then this is the place to do it. 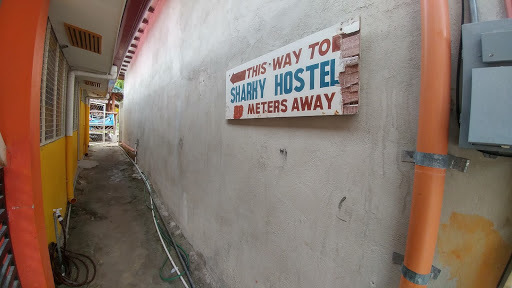 Stay at the more rustic hostel – Sharky Shark for 1 night (check in ends at 10pm) as they are the first boat that goes out at 6am (wake up: 4:30am) with 30 min snorkel time (cost: $30-35). 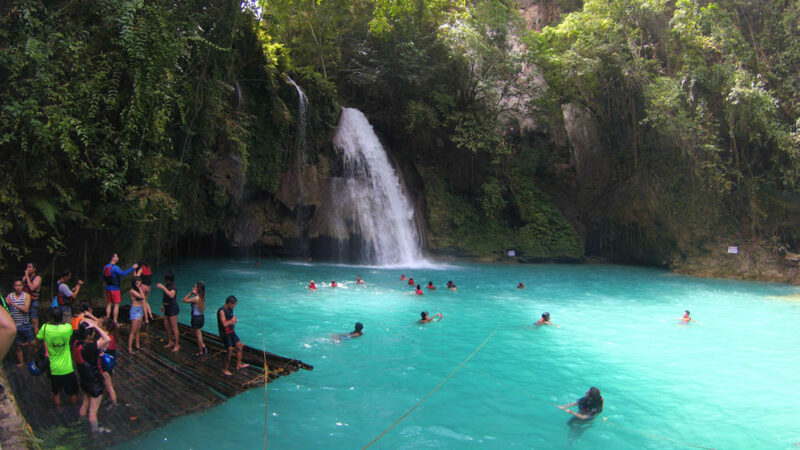 Tumalog Falls – these nice falls are only 5-10 minute drive from Oslob center, a guy will take you for 150 pesos round trip on his bike. Small entrance fee. 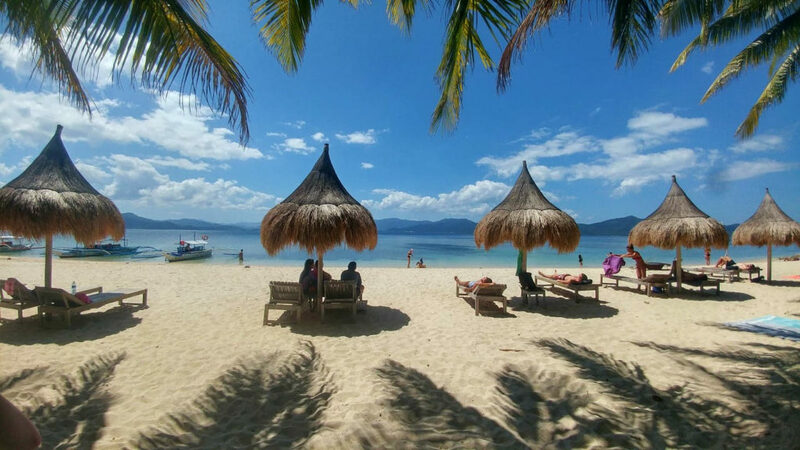 Sumilon Sand Bar – only worth seeing if the weather is nice and the tide is good. But if you are in Philippines for a while, go to Kalanggaman Island sand bar- supposed to be mind blowingly beautiful. Chill! Bring a book and enjoy the chill vibes and fun backpackers you will meet. How to get here: Ideally base yourself in Dumaguete. To get to Apo for a day trip, take a bus to Malatapay and find 5 other people to split a boat with ($75 per boat) and the ride is 30-40min, with a latest return time of 3pm. Everyone’s sea turtle pictures from here looked incredible, I did not get a chance to go! How to get there: ferry from Siquijor, Cebu city, Oslob, and more. 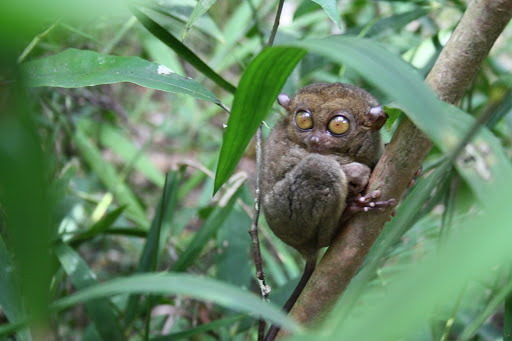 I had several bad reviews from people before going to Bohol, but I still cannot understand why. 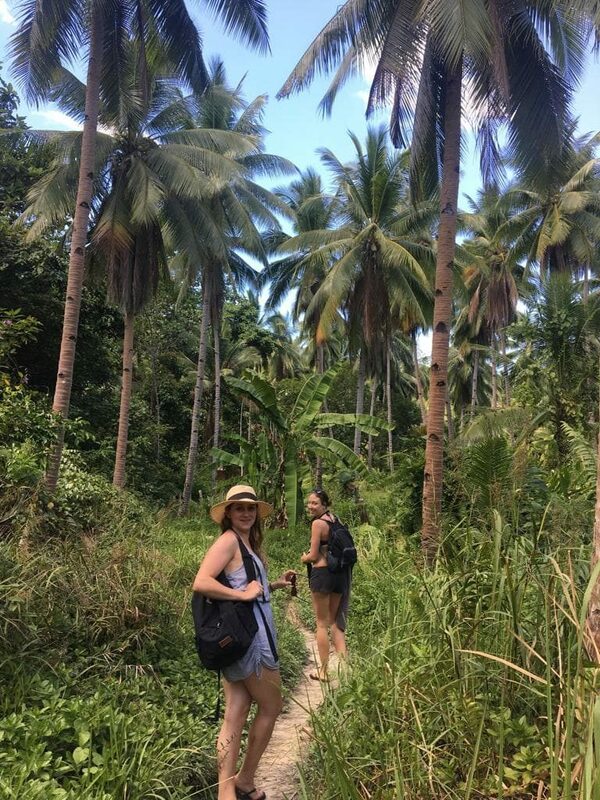 It has beautiful green scenery, but the only catch is it takes a long time to get places (enormous island) and maybe travellers got turned off by the touristy beach area in Panglao. Aside from the famous Tarziers (I went just to see them – so worth it!) and chocolate hills, we saw signs for crocodile farms, Ostrich farms, and all sorts of things to see there. Apparently the east side is also nice, but most travellers do not make it out that far. Accomodation: Best hostel was the Oacis Balili Heritage Lodge hands down. You will 100% meet people if you are travelling alone. 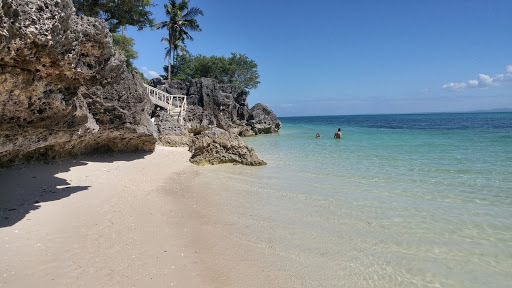 Tagbilaran city is a good place to base yourself (cheaper) – that way you can explore bohol, or go to Panglao to dive. Getting around: easiest is motor bike. Local buses and jeepneys also possible. Tarziers (see them at the Sanctuary as they will be in natural habitat vs cages. Aim the the afternoon as they sleep with eyes closed during the day). 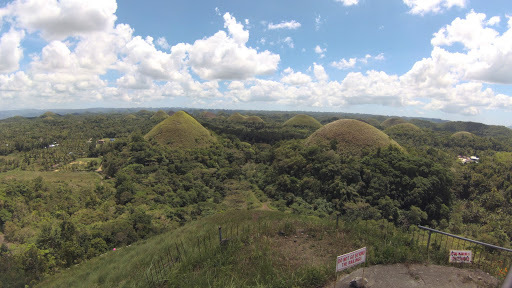 Chocolate hills – 1.5hrs drive from the port city. Great for pictures! 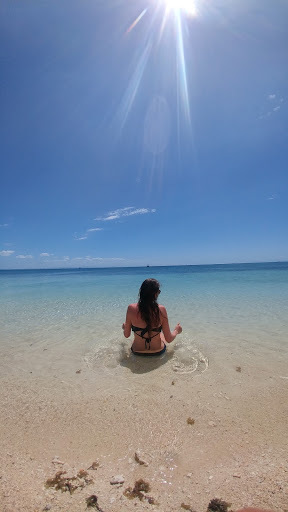 Panglao beach – everyone said it is overrated and way too saturated with tourists. I did not bother. If you go I heard bikini beach is nice. East coast: Anda beach and some cool cliff jumping in waterfalls. 2nd most loved spot by travellers- You come here and stay a lot longer! How to get there: fly, or 16 hour overnight ferry from Cebu City Port (⅓ cost of a flight). Rent a scooter and explore! *If you cannot go to Siargao, and have an extra 3-4 days, see my ‘Other Destination’ options at the end of this article. I would recommend Bantayan Island. Thanks to @fab_Imz for info contributions. Puerto Princessa has its charm, and I was the only guest in my good rated hostel. Most people land and go straight to Port Barton or El Nido. Benefit – many ATM options to get cash before heading north. El Nido has 1 ATM and Coron airport ATM was broken. NOTE* you cannot bring mangoes from PP to El Nido (pest control thing going on). So don’t stock up at the market. Iwahig town to see fireflies (but note you can see fireflies in Bohol and Coron), and it is 1-2hours from PP. How to get here: 3 hour bus from Puerto Princessa or El Nido. This was the place where you thought to yourself, wow those people who skipped this town to go straight to El Nido really missed out. Its a hidden gem with access to beautiful beaches. Not too big, a mix of local and touristy food, nice beaches, live music bars, and has night life. Accomodation: Russels place without a doubt! For the price you cannot beat what you get. Getting around: you can walk it! Coconut and White beach: Walk along the beach coast for 1 hour to both Coconut beach and White beach. They are both picture and instagram worthy. Walk even further to Jungle Bar, but it was empty when we went & they did not have half the menu available. Eat at Gorgonzola for enormous wood oven pizzas, Else’s place on the beach, or the cheap Filipino place (ask for the places with all the flags on it). Party at Cocorico with free drinks at 7-730 every night → after hangover bar. Walk on the beach at night to see the stars! How to get there: 6-7 hour minivan bus ride from Puerto Princessa or 3 hours from Port Barton. You can also fly with Airswift or Cebgo ($120-150 per flight into/out of these tiny airports). 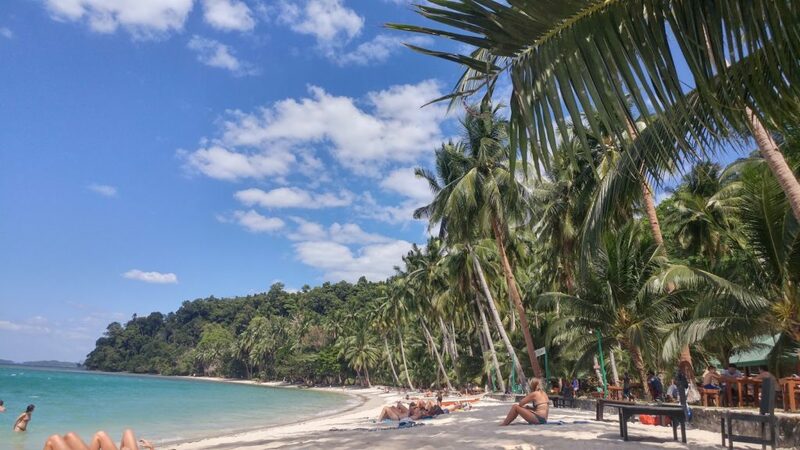 Where to stay: El Nido Beach (where the ferry arrives) is the party & happening area. If you want a quieter but still has stuff around + on the beach – southern strip from Corong Corong beach / where the bus stop is. But note the main road is loud and not so pleasant to take a walk. Second, there is not much swimming on these beaches in El Nido as water is very shallow and crowded with island hopping boats. To swim visit Las Cabanas beach (5-10 min ride). Party spots: bars that stay open the latest are on El Nido beach at night. Only go to the Outpost Hostel bar (need a taxi to get there) if you want fun pre-drinks as it closes at 10pm! And finally Mad Monkeys at Nacpan beach! That was one of my best party nights on my entire trip! Accomodation: Spin hostel is pricey but really pretty inside, good location, and good wifi. For Nacpan beach (40min from El Nido) 100% Mad Monkey Hostel if you like to party & see an actual monkey! 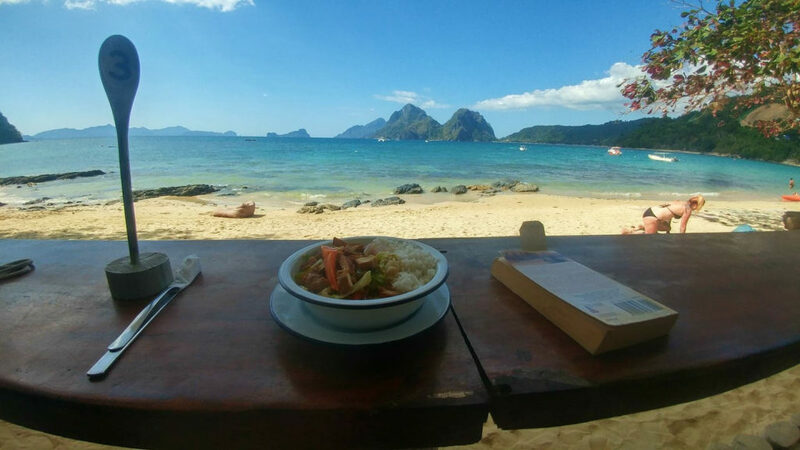 WARNING: many people including myself got food poisoning in El Nido. Careful with water, ice, smoothies, and even showering water to not get in your mouth. NOT fun. Bring meds. Tour A (to see the famous big lagoon). Private boat tour – you can walk near the ferry port and find a boatman to take you out privately for a good price (1500 peso/group), but do book it in advance (+2 days) because they need to register you early in time for the big lagoon (max # people entry / day). Private is 100% worth it as they leave early and you get to places before the crowds. 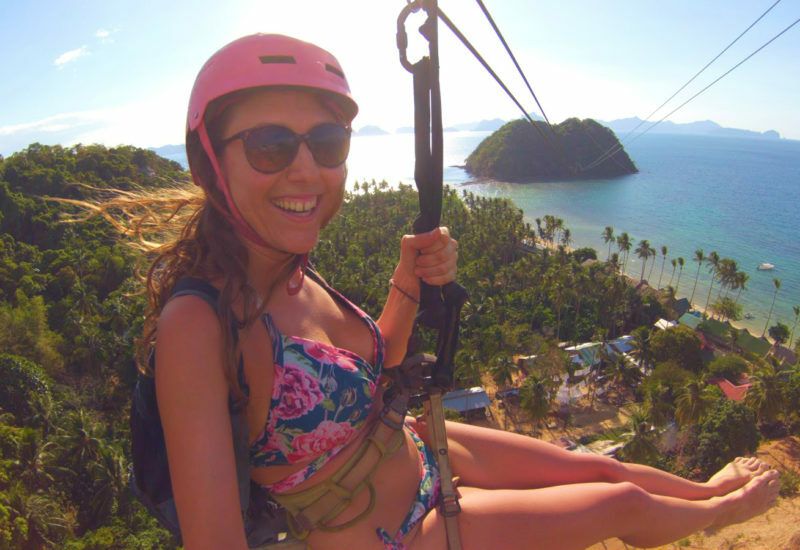 Ziplining & watch sunset at Las Cabanas beach – you can day trip here to tan, swim, and chill. (Ziplining 500-700P) Caution: I got food poisoning here. Boodle fight restaurant – try it if you like seafood! Nacpan beach day trip (Mad Monkey Hostel by night – free drinks from 7:30-8pm!). If you walk into the village area there is a cheap local restaurant. It is definitely much cheaper to get here by scooter then taxi. Otherwise not much to do in Nacpan except beach bumming and swim in the wavy sea. I also went to Duli beach past Nacpan, but I did not think it was worth the hassle of the bad roads as it looks similar, but much less people if you like it quiet. How to get there: fly, island hop tour from El Nido, or 3.5hr fast ferry from El Nido (book at least 1 week ahead online). My ferry broke down, so I had to book a last minute flight at 6am. Accomodation: HOP HOSTEL hands down! Treat yourself to that kind size bed & no more to be said! It’s a beautiful place that makes you feel like you are in Greece. Book it in advance!! Fireflies & plankton tour with buffet dinner on the water. This tour was cute! Plankton was so cool, but don’t expect to see millions of fireflies at once (maybe 10-15). 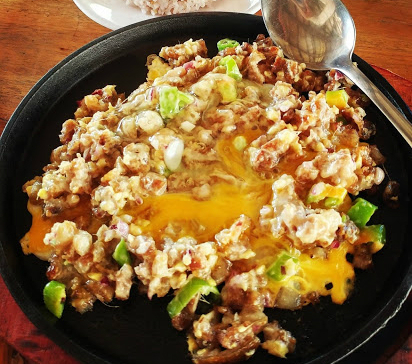 Ocam ocam – this is a recommendation from some people I met if you want to get a cheap cabin in a beautiful area in the boonies out of Coron town. I stayed here for 4 days since I got great vibes upon arrival. 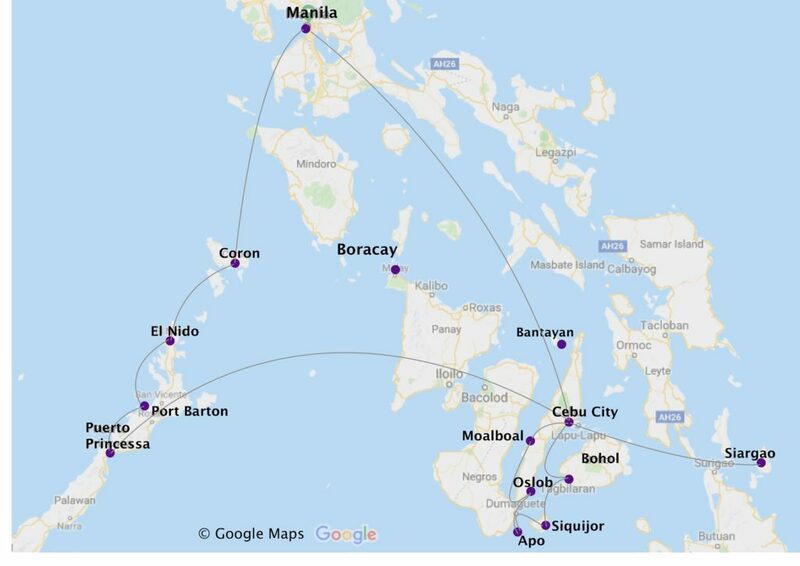 But since it is off the classic route, I only recommend it for people who have at least 4 weeks, want a quiet off the beaten path destination, or cannot include Siargao Island. Every backpacker stays at Casa Isabelle Hostel, so you will meet people no problem there. 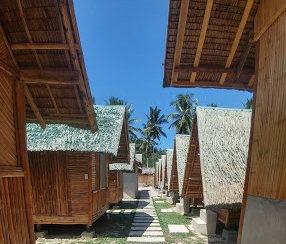 It’s a basic hostel, cute full kitchen, limited bathrooms, and spacious clean beds. Things in Bantayan are cheaper than other islands. Its almost like a mini village and I really liked it. The beautiful picture-esk beaches are reached by scooter/taxi (Paradise beach) or boat (Virgin island – day trip – must find people to share a boat with). You can scooter into town 11km away and see local food markets and eat for cheap. Not too much partying but we managed to get lucky and found a high school foam dance party! Banaue: if extra time here, overnight bus to Banaue from Manila (9hrs) to see the stunning rice terraces and hanging coffins. Bring warm clothes! Boracay: If you like being with many tourists, okay with higher prices for food and drink and want to party – this island is for you. Beaches are supposed to be amazing after they shut it down for months to clean it up. Beware Chinese holidays as you can barely move on the beach! Kalanggaman Island: a local recommended it as the nicest sand bar in the Philippines, but it takes time to get there. Laundry services available in most hostels and towns (4$ / load). Atms are rare outside big cities, so carry cash. Buses usually have food stops and snack sales people. City Shopping: Regular malls in the Philippines was nothing special to me as they had no unique clothing stores, and western stores were the same prices as back home.